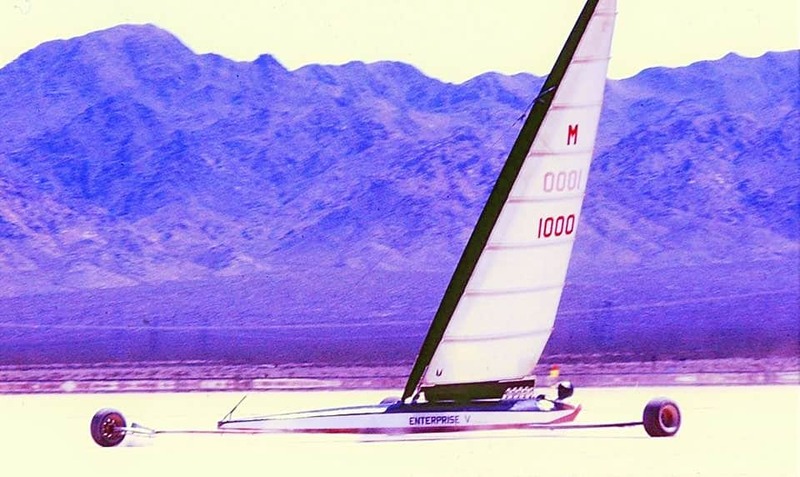 4LIYC Skeeter sailor Gary Whitehorse sails his converted iceboat on the Ivanpah dry lake near Las Vegas in 1984. 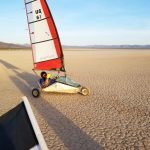 Ice sailors have been making the spring pilgrimage to the “cathedral of land sailing”, the playa at Ivanpah, for several decades. Pewaukee Skeeter skipper Bill Dale has been at it the longest, sailing in NALSA events for 40 years. 4LIYC members Jim Nordhaus, Geoff Sobering, Scott Geotz, Kyle Metzloff, and Wayne Schmeidlin have been competing in Blokart regattas there for the past several years. 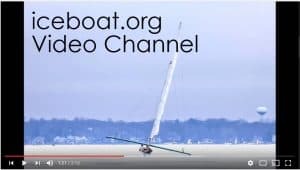 At this year’s Blokart North Americans, Jim Nordhaus’ iceboating skills helped to take him to second place overall in Performance (think Gold fleet) and first in his fiercely competitive division. A Blokart speed record of 77.7 mph was set by Scott Young and Dave Lussier on the last day of competition. Read more about that on Scuttlebutt. 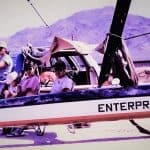 Gary Whitehorse recently shared photos and memories on Facebook of the time he sailed his iceboat ENTERPRISE at Ivanpah. Gary Whitehorse posted the following on Facebook: “1984, we thought we would try our skills at land sailing. Ivanpah Dry Lake was not far from where we lived in Lake Havasu, AZ. I finished 4th in Class 2 (the fastest class at the time) at the World Land Sailing Competition. There are many good stories on how this all came together. Jim Nordhaus crosses the finish line in first place. Ron Rosten hauled the boat from Wisconsin to the desert.